Action from the Peterborough 5k Grand Prix race at Ferry Meadows. Nene Valley Harriers hosted the first race in this year’s popular Peterborough 5K Grand Prix Series at Ferry Meadows and there was a record field of 338 finishers. It also marked the first victory in a senior road race for 17 year-old Nene Valley Harrier Alex Hampson. An early-season highlight of the local track programme has been the battles between Hampson and his 20 year old team-mate Lloyd Kempson. This rivalry brought out the best in both runners on a bright and breezy evening. The Nene Valley youngsters dominated proceedings from the gun, and it was only in the final kilometre that Hampson pulled away crossing the line in a personal best (PB) time of 15.31. Kempson followed him home 15 seconds later. 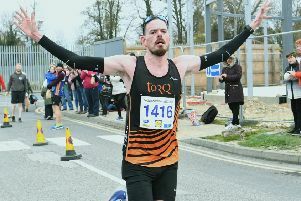 It wasn’t all about the youngsters though, and the evergreen John Pike running for Newham and Essex Beagles was third over the line in 16.07, with Yaxley’s James Mogridge and Nene Valley’s Rhys Goddard not far behind in fourth and fifth places respectively. The runner-up in last year’s series, March AC’s Mellisa Neal was the first lady home in 18.48 with second place going to 15 year-old Megan Ellison of Nene Valley, who recorded a time of 19.29. This gave Ellison a 22 second advantage over third-placed Michelle Brett of Ramsey. The junior 3k race was won by Andrew Worrall of Bedford and County AC, but Nene Valley dominated, having 11 of the first 14 runners home. The city club’s pairing of Ethan Ellison and Olly Oakley battled it out for second and third places, and the girls race was a close run thing between another pair of Harriers, Amber Park and Flo Brill, with Park coming out on top by just two seconds.